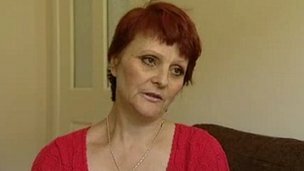 A woman who campaigned to raise awareness of lung cancer caused by asbestos has died, members of her support group have confirmed. She believed she developed the illness through contact with her father, an asbestos lagger at Devonport Dockyard, when she was a child. She was admitted to the city's St Luke's Hospice on 31 May. Speaking to the BBC on 7 June, Mrs Brewer said she believed her admission to the hospice was just a "blip" and she was "trying to get her strength back". She also said awareness still needed to be raised about her condition, and the substance that caused it. Mrs Brewer believed she developed mesothelioma from hugging her father, Philip Northmore, an asbestos lagger at Devonport Dockyard, when she was a child. She used to hug and spend time with him when he came home from work from the dockyard between 1963 and 1966. The mother-of-three said his job involved scraping asbestos from pipes, that he would come home covered in dust and the exposure as a child was the only time she would have been linked to asbestos. Mrs Brewer launched a website to offer support to other sufferers, and underwent experimental treatment in Frankfurt, Germany, which she paid for with her compensation.